How do "accounting" reports outside SellerCloud compare with financial reports in SellerCloud? Do SellerCloud's Orders reports differ from its Sales reports? Why are there 2 report formats? Can I easily change my filters after I run a report? Are all grid columns sortable? Is SellerCloud report data in real-time? Can every employee see my company's Reports data? What is the difference between Summary and Detail reports? How do Subtotal and Grand Total differ? How do Item Cost and Item Cost Total differ? How do Item Cost Total and Order Cost Total differ? What does the Total Fees column include? How do Cash Profit and Accrual Profit calculations differ? What is the Settlement ID filter in the Transaction reports? How does the Orders Status filter work? 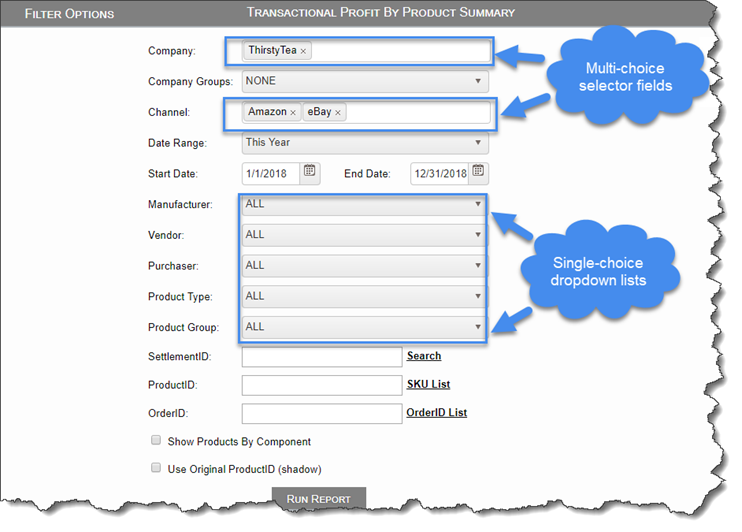 Where does SellerCloud show transactions that are not order-related? What are the Settlement Reconciliation Summary and Settlement Reconciliation Details reports? Be sure to also watch this one-minute Reports Introduction video. Sales Order - This transaction occurs when Order A is placed. Typically non-posting. Invoice - This transaction occurs when Order A ships. Typically used for reports. Order Date - Is used in place of a Sales Order. Ship Date - Is used in place of an Invoice. Orders Reports - These are based on your orders' order date and include pending orders and processed orders (unshipped and shipped). Sales Reports - These are based on your orders' ship date and include only shipped orders. Here's an example: If orders are placed on the weekend and you run a Sales report on Sunday afternoon, you won't see those orders. Why not? SellerCloud uses the ship date for its Sales reports, so because you did not ship on the weekend, you won't see those orders on that report. However, Monday's orders will show in your Monday report - after you ship those orders. So, if you want to see orders as they are placed, use the Orders reports. In SellerCloud (grid) - Choose your criteria and click Run Report to see data on the grid. If needed, use the bottom scroll bar to view more results to the right. Exported spreadsheet (Excel) - From the grid, click the Export to Excel icon (where is it?) to download the onscreen data to a spreadsheet and see additional columns of data. For example, the P&L Detailed Report grid has a Transaction Fee column, but the spreadsheet adds another column for Drop Ship Fee. Excel provides the additional power to manipulate your data, such as filtering within a column and sorting with advanced parameters. You can even create custom bar graphs and pie charts; for example, to show daily sales trends for a selected date range! Your filter choices build on each other; each subsequent choice further narrows your search results. Most of the report filters offer multiple choice selector lists as well as single-choice dropdown fields. The selector fields let you manually click in the list to choose multiple values, while the dropdown lets you choose only one. Show me the difference. Yes! Click the Edit Filters icon above the grid (show me where), change your filter(s), and click Run Report. Note: You can only revise the filters from the grid, so for an exported report, return to the grid and re-run the report with your new filters before re-exporting. Yes, click each grid column's header to sort in ascending and descending order. You cannot sort multiple columns simultaneously. Your server has built-in services that run daily to check for orders that have recent changes and update profit and loss data accordingly; therefore, accuracy will vary based on the time of day you run a report. ﻿Order - A refund comes in on an order. The reports will not show the change until the services update the order. Product - You change a product's default vendor. The reports will not show the change until the services update the product. No, the only employees who can access the Reports module are those with appropriate security roles, as set by the SellerCloud administrator at your company. Here's an example: The P&L Summary report shows profit totals for all orders by either channel or company, but the P&L Details report drills down to show profit for each order. Both versions are offered in most SellerCloud report categories (P&L, Sales, Orders, etc.). Note: You can always open the detailed version of a report directly from its summary to show data based on that summary report's filter. Subtotal is the total amount of the items before any discounts, shipping, tax, etc. Grand Total is (Subtotal + Shipping + Handling + Insurance + Gift Wrap + Tax) - (Discount + Shipping Discount). Payment is the actual amount the buyer paid. Usually, this is the same as Grand Total (the total order amount) unless there was an underpayment or overpayment. Item Cost is the cost of the items in the order. Item Cost Total is (Item Cost - Rebate) + Shipping Cost + Commission + Transaction Fee + Posting Fee + Dropship Fee + Co-Op Fee + Tax Payable). Note: Order Cost Total is used in the calculation of Profit Margin. Generally, this column encompasses the following; however, certain reports may include other fees, such as tax payable, dropship fees, and co-op fees. See each report's description for specific fees. Transaction fees - These are Paypal processing fees. Posting fees - eBay listing fee and Reverb bump fee. In traditional accounting, Cash Profit is based on Payment date and Accrual Profit is based on Invoice date. Thus, Cash Profit is current, based on payment(s) made, while Accrual Profit is a future profit. In SellerCloud, you can choose either Cash Profit or Accrual Profit for your profit calculation, which will be based on your orders' ship date, regardless of if/when any payment(s) was made. Note: Even if you choose Cash Profit when running a report, you can always see each order's Accrual Profit by clicking open the order and hovering over Cash Profit on the P&L tab, and vice versa. Cash Profit - Based on Payment amount of an order (the actual amount the buyer paid). Calculation: (Payment - Refunds) - (Item Cost + Total Fees) + Adjustments. Note: Wholesale orders that have payment terms will not show profit until payment is received. Accrual Profit - Based on Grand Total amount of an order, so you can see profit for orders that haven't been paid. Calculation: Sum(Grand Total) - (Item Cost + Total Fees) + Adjustments. Settlements are payment reports sent by a channel with all information about an order, and including order-related fees, commissions, and taxes. Some SellerCloud reports can be based on a settlement ID: Simply enter an ID (or search from a list of 20 most recent IDs) to obtain all related transactions for that settlement. This produces an accurate P&L based on that settlement. Note: Currently, the Settlement ID filter works for Amazon/FBA, eBay, and Newegg orders. A settlement is a payment report sent by a channel with information about order-related fees, commissions, and taxes. 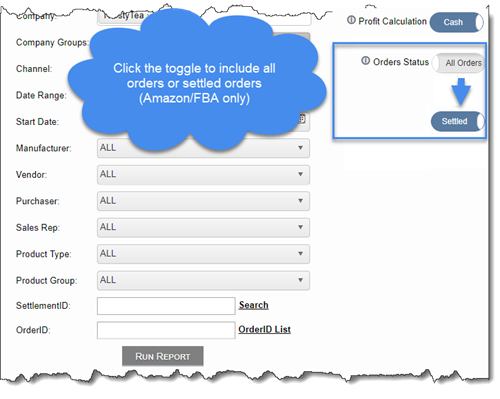 Currently, this toggle is for Amazon/FBA orders only. All Orders - Include all orders. Your report will show orders that do, and do not, have settlement data. Settled (this setting will show true profit) - Exclude orders without settlement data. Your report will only show orders that have settlement data available. Profit by Product reports - (Summary and Details versions) - These reports show product-related transactions, such as Warehouse Lost and Warehouse Damaged. Only available for Amazon/FBA and eBay channel transactions. Transaction Details by Date report - In addition to product-related transactions, this report shows transactions that are not related to products or orders, such as FBA Inbound Shipping Fees and Subscription Fees. These reports pinpoint the location of discrepancies between SellerCloud data and settlement data from your channel(s), and exactly why the data does not match. Example: Suppose your report shows a discrepancy in an order. Perhaps a discount came in, but the Settlement report does not show it. Just click on that Settlement ID to open the Details report and filter by unreconciled transactions. From here, you can either manually fix that data, or you can dismiss it for now, fully aware of this current discrepancy. Note: Currently, this report is available for Amazon/FBA only, but SellerCloud will add other channels in the future, such as WalMart, Newegg, Jet, etc.